Gold Tracker Software EarlyBird offer. 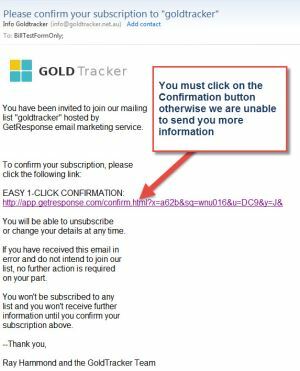 The newsletter Udo and I sent last week had a link to a page with the sign up form for information about the Goldtracker software. Some people had difficulty with accessing that link to get on the Earlybird list so I have included the link again here. We are sincerely sorry if this was an issue for you. SIDEBAR...The reason why is because you get your mail in Plain Text which does not have the full link address. and then paste it into your web browser for it to work for you. The form will not immediately appear on the page, please be patient and allow a minute or so for the form to appear. The people who sign up to this list will be able to have DOUBLE the clicks on Goldtracker when it is launched in a week or so. The Earlybird list is called a ”Double Opt In” list which protects you against spam. This is why after you complete the form you have to confirm that it was actually YOU who requested the information, otherwise we are not allowed to send you any information at all! (1) You complete the form on the: GoldTracker Form Page. GoldTracker Earlybird List Successful Subscription. Gold Tracker Software is set to Revolutionise Targetting of Potential Gold Areas and save you time in research. We are really excited about www.goldtracker.com.au because it gives you a score of the Gold Potential for over 1 million locations in West Australia. The Prospectivity (or Potential of gold mineralization) is the likelihood of the presence or absence of gold in each of those locations. This is truly revolutionary and not even been attempted . Thousands of hours and Mega dollars have been put into developing the software and algorithms. This is how is the score of gold prospectivity is calculated and allocated to each of those over 1 million points in WA. A: Economic History - The economic geological history of the area, evidenced by either presence or absence of previously discovered or indicated gold occurrences. B: Lithology - The presence, distribution and type of rocks and overburden. C: Structural Geology - The presence, association and relative distribution of structural features including for example faults, folds, intrusives, metamorphic and altered zones, and geological boundaries. D: Other - Presence of alignments, palaeo-channels, stratigraphic unconformities. The massive database immediately assesses the prospectivity for Gold Mineralisation provides a prospectivity score at a specific point which is true for a radius of around 800metres around that point. Even Better, if the area you have chosen has a poor prospectivity score, THEN YOU JUST ASK FOR THE NEAREST BEST LOCATION! When will GoldTracker be Released? GoldTracker will be released within the next 14 days so make sure you are on the list for the EarlyBird specials. We will have more information for you on the Goldtracker website within the next two weeks.